Rebels has kicked off and…overall, I liked it. Last week we had the one-hour premiere with a movie on the Disney Channel. This week the season officially got underway with its first episode on Monday night. I loved the movie. I thought it was exactly what Star Wars should be and how they should approach the series. They stayed away from any characters we knew and the only glimpse we got of a familiar character was a hologram recording of Obi-Wan Kenobi. The recording was the one he released in ROTS, warning all Jedi to stay away from the temple and that the Jedi are no longer safe. Other than that – we were introduced to a completely new band of characters. We have Hera the Twi’lek pilot who commands their ship Ghost, Kanan the undercover Jedi, Zeb is the Lasat who is really the tough guy of the operation (and his species is based on original concept drawings of Chewbacca! ), Sabine the Mandolorian who is kind of a pyro and graffiti artist, and finally we have a newcomer named Ezra. A kid of the streets who gets pulled into this little clan and decides to stay to do some Jedi training with Kanan. 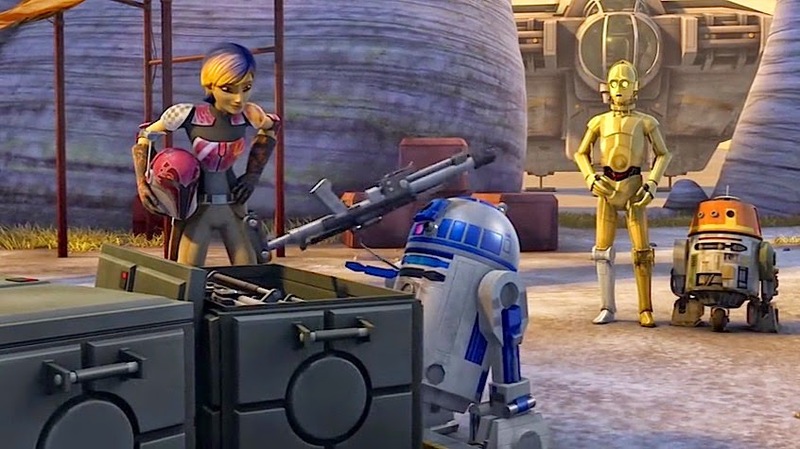 Oh, and we can’t forget Chopper: the little astromech droid who helps run the ship. They did a great job on making him seem pretty different from Artoo, a fear I had. The opposition to this team on a larger scale is, obviously, the Empire. Specifically, at this point we know of two beings: Agent Kallus, an official of the Imperial Security Bureau and The Inquisitor, a Pau’an male who hunts down remaining Jedi. We have not seen much of him yet – only saw him at the end of the movie when Kallus reported that he had found a Jedi (Kanan). What I liked most about the movie is that we were introduced to new areas, new people, new ships and my imagination was opened to a part of Star Wars I didn’t know, but there was “something familiar about this place”. Ralph McQuarrie’s touch was extremely obvious and some of the landscape shots were ripped right off of what he had done for the OT. Not saying that’s bad, in fact, it gave us the OT feel. I was most surprised at the time period of Rebels. Apparently it takes place 5 years BBY. I completely missed this somehow. That means that Luke and Leia are 14 and the Jedi have been written off the galaxy for 14 years. What made me question this time period is that the need to have an Inquisitor means that there are still quite a few Jedi throughout the galaxy. I don’t like that. Jedi shouldn’t be that prevalent still, right? Han Solo was really skeptical of the Force and Luke barely knew anything about Jedi. 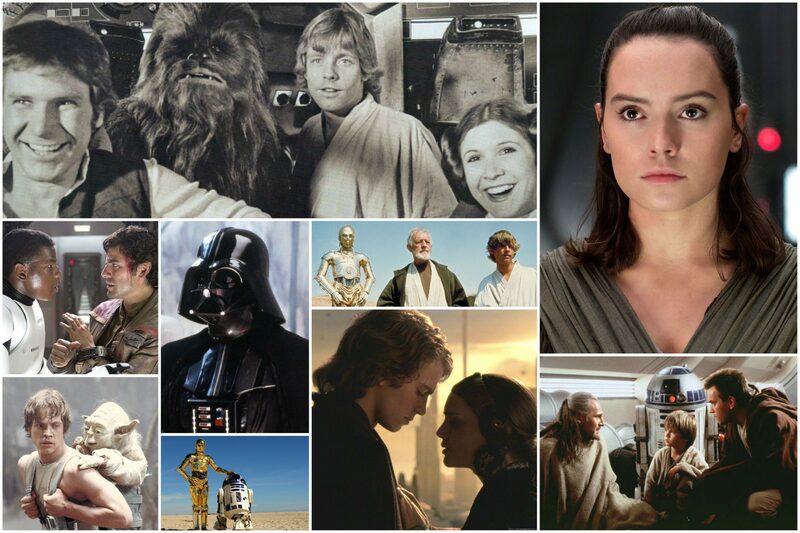 If Luke and Leia are 14 at this point, and Han would be older, wouldn’t it mean that the knowledge of Jedi would be a little more common? Also, they are making this group of misfits look like the beginning of the Rebellion. The Rebellion should have been pretty much established by this point in the game, even if they are not completely rebellious (pun intended ha!) yet. The crew on Ghost are smart; I think they would have heard about the Rebellion through their travels across the galaxy and at this point either joined them or aided them in some way. Which brings me to the first episode of the TV series. After coming off of a successful premiere movie, I cringed and got angry when I saw C-3PO and R2-D2 appear in the first official episode. UGH. Really?? I know that other people have no problems with this but I do. I was hoping that Rebels would stay away from that trap of bringing in familiar characters to satisfy all audiences. Seeing Threepio and Artoo made the galaxy seem smaller than it actually is. Do you really think they would run into these two droids? Really? It was completely fine in TCW, because they had every single PT character running around that why not bring in everyone we know? In fact, I got used to that in TCW. But Rebels clearly seems to be reminding us that this is a new band of characters on new planets and in new situations. The cherry on the cake was when they drop off the droids at, of all ships, the Tantive IV with Bail Organa. (bangs head against wall) I was expecting a teenage Leia to just stroll in and talk with her father. Thankfully that did not happen and I was spared, but if we are going to introduce Organa this early in the series, maybe I should just brace myself and expect it to happen at some point. 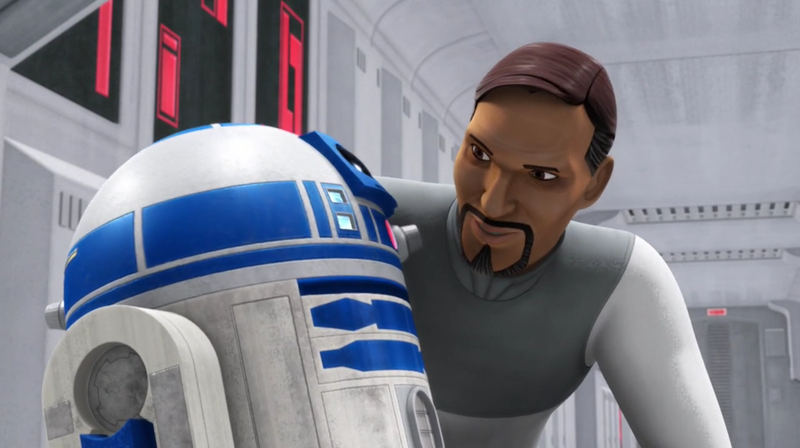 The only interesting thing about the situation was that Artoo had recorded some of the conversations on Ghost and had brought it back to Organa who noted that they should keep an eye on them. I still think they could have used other droids and a different character for this, but maybe by the time the series ends it will tie back to bringing the crew of Ghost into the Rebellion. And, by the way, shouldn’t the droids be pushed off onto Captain Antilles at some point? They’ve really been with Organa for 14 years? Other than my major grievance with the droids, Tantive IV, and Organa – I think the first episode was pretty cool. They stuck it to the Empire by stealing their prized weapons that were supposed to be illegal throughout the galaxy, and then later destroying them. It spoke to an interesting larger lesson: the Empire can do what they want, regardless if weapons are illegal or not. In the hands of the Empire, those laws are conveniently forgotten if it will further their cause. Ezra showed us some of his Force powers…he has more than I thought. But they came into action when he was angry and scared. Not very Jedi-like, eh? So Kanan will have to curb that and teach him how to use the Force in a calmer state. Or will Kanan change the rules a bit and not follow the strict Jedi Code? Speaking of Kanan…I couldn’t really figure out how old he was. I was guessing late 20s or early 30’s. Oh – nevermind, Wookiepedia says he’s 28 and was 14 when Order 66 happened. I find it hard to decide whether or not I will like the series based on what I’ve seen. I loved the movie, giving it an 8.5/10, but felt the first TV show would come in at a 6/10. Okay, I’m almost done, I swear. Two side notes! Greg Weisman has left Rebels. I am most sad about this as he was the one person I was really pumped to have part of the show and thought would lead it in a smart, good direction. But why did he leave? I can’t find anything online so if anyone has information on this, please let me know to satiate my curiosity. Kiri Hart. I can’t go further without mentioning her. You guys know how often I have talked about my unusual name and how I’ve never met anyone else with my name. Well, guess what? She is the VP of development at LFL and oversees a lot of the Star Wars content produced by Disney…including Rebels. Look for her name at the end credits of Rebels. SUPER WEIRD. SUPER, SUPER WEIRD. But I’m loving it. I would not wish anyone else to have my name but someone at LFL. It’s a sign. I’m not sure of what, but it’s a sign. Good points, all. I am also feeling optimistic; the pilot movie was soooo much better than the TCW one. I also want them to stay away from the main trilogies’ characters; let’s see something new! It’s a big galaxy. I think the idea of the Inquisitor seems unnecessary, but we’ll see how it goes. Well who would hunt down the random Jedi that pop up if not the Inquisitor? Darth Vader? I think at this point, 14 years later, this is beyond him. Tarkin? Wouldn’t stand a chance. I think it’s interesting and could lead to some good plot development…especially if Vader kills him at the end or something MUAHA. I don’t know why Jedi are still popping up 14 years after Order 66…that’s MY problem! It kind of takes away the mystery of the Jedi in ANH. And I agree, stay away from known characters. But, it’s a TV show, and they want as many viewers as they can get so that means bringing in familiar characters. Yuck. OMG YES – pilot movie was WAAAAY better than the TCW one. The TCW one turned me off of TCW for 3 years. Gosh it was horrible. I still cringe to remember it. I had taken my new boyfriend (now husband) to it and was super excited and then just embarrassed. I left it thinking, “Is it okay to hate something in Star Wars?” LOL.